Chapter Two TCR—Triple Calendar Round—confirms Chapter Two’s status as the world’s most legible triple calendar wristwatch while showing that Maîtres du Temps is the horological master of the sporty and casual as well as the elegant and complex. Two of the world’s greatest living watchmakers, Daniel Roth and Peter Speake-Marin, have pushed the boundaries of haute horlogerie by creating a timepiece in which every single aspect—aesthetic and horological—has been meticulously refined to perfection. Chapter Two TCR sees Maîtres du Temps’ distinctive day and month roller indications seamlessly integrated into a complex circular case of high-tech Grade 5 titanium, available with either a high-polish finish or with sleek, black PVD. The curved lines of the case are accentuated by eye-and light-catching 45° bevels along the case band that flow around the round, matte-black ceramic bezel to focus attention on the high-contrast, high-legibility dial. Central hour and minute hands are complemented by bold over-sized hour indices—with Roman numerals at 12, 3, and 9 o’clock—all filled with bright white Super-LumiNova that glows a vivid green in the dark. Arabic numerals mark five-minute intervals around the chapter ring, while small seconds at 6 o’clock are indicated by a visually arresting bright red hand that complements the 15-minute markers. 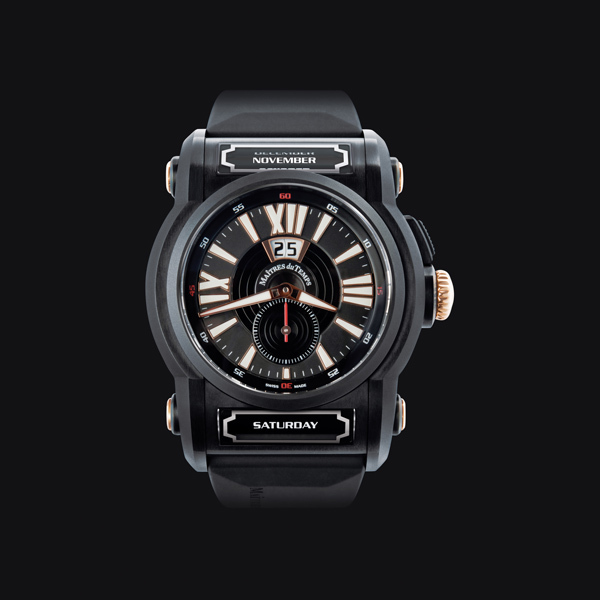 While this ensemble of clear, clean indications makes for the most readable of time-telling experiences, the big date window at 12 o’clock and the month and day-of-the-week indications—spelled out in full on their respective rollers in engaging Serpentine font—offer unprecedented legibility in a triple calendar wristwatch. As you might expect from the superstar lineup that developed Chapter Two, every single detail has been carefully considered, both visually and functionally. To ensure unmatched visual access to the dial-side indications, three anti-reflective sapphire crystals are utilized: one over the main dial and two curved crystals over the rollers, which are metalized to frame the month and date. For ease of operation, there are two ergonomic, paddle-shaped pushers, each engraved with their respective functions, and located on the caseback to adjust the month and day rollers. Similarly, the engraving on the big-date pusher in the case band at 2:00 identifies its function. 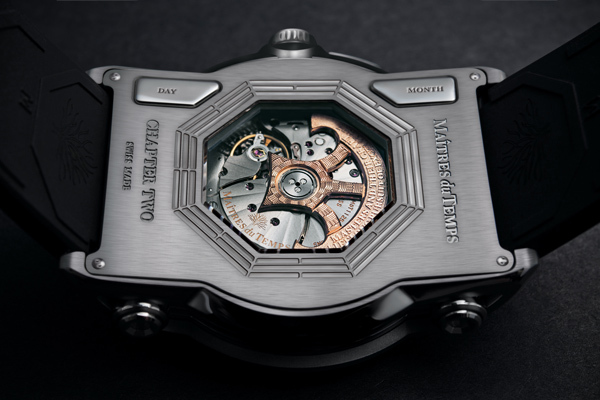 The octagonal sapphire crystal display back provides a window to Chapter Two’s groundbreaking movement, which was developed by Vaucher Manufacture Fleurier in close collaboration with Peter Speake-Marin and Daniel Roth and was extensively tested, refined, and beautifully decorated until it satisfied the master watchmakers’ most exigent standards. Through the display back, the eye is immediately drawn to the richly engraved and symbolically goblet-shaped rotor of the automatic winding system. The intricate panier guilloche decorating the rotor’s center provides a noble counterpoint to the text engraved around the rotor’s periphery: Maîtres de Temps’ motto, Masters and Their Craft—A Lifelong Pursuit of Excellence. The richly hand-decorated movement features a veritable melody of harmonious fine finishing, from the sun-ray Côtes de Genève on the polished hand-beveled bridges, to the helical spirals and perlage on the mainplate, to the mirror-polished screw heads. Finally, the cool, casual aura of Chapter Two TCR is perfectly completed by a black, natural rubber strap with titanium folding buckle. With Chapter Two TCR, Daniel Roth and Peter Speake-Marin have taken Maîtres du Temps into new and exciting territory, says founder Steven Holtzman. This is the first of our timepieces to sport a more casual design. The resultant style and vitality exuded by Chapter Two TCR shows the amazing versatility of these consummate watchmakers—as well as that of Maîtres du Temps. While sporting a casual vigor, Chapter Two TCR exhibits all the essential DNA that has propelled Maîtres du Temps to the forefront of horological design and innovation: in particular, the signature roller indications, octagonal motifs, and superlative fine finishing and construction. And its striking round dial ensures that the world's most legible triple calendar wristwatch now has a supremely readable dial to match.